When James Bond is posing as Peter Franks in Diamonds Are Forever, he can’t help but ask his intriguing cohort Tiffany Case out to dinner. They agree that after their smuggling job is over that they will have dinner in New York at 21 on Friday night. 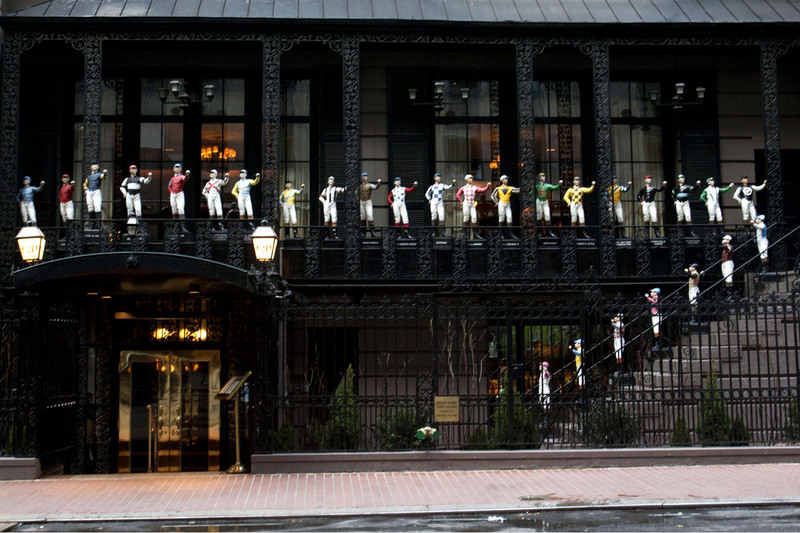 21 is a historic restaurant located at 21 West 52nd Street in Manhattan. Like Sardi’s it is a hangout for the rich and famous. It was once a speakeasy during Prohibition (never busted) and has been in its current location since 1929. They talk shop, with Bond discreetly trying to get information from her about her employers, consume several vodka martinis (shaken, and not stirred and with lemon peel) order dinner and Clicquot Rose champagne. They were interrupted by the arrival of the cutlets, accompanied by asparagus with mousseline sauce, and by one of the famous Kriendler brothers who have owned ’21’ ever since it was the best speak-easy in New York. “Mac” was Maxwell Arnold “Mac” Kriendler. Fleming interjects a real person into the narrative here, likely he had dined at 21 and knew “Mac” from those visits.